You’ve got data and you’ve got questions. You know there’s a chart or graph out there that will show you the data you want to see, but it’s not always easy knowing which chart or graph is best without some trial and error. This paper pairs charts with the type of data you’re analyzing and questions you want to answer to help you find the appropriate chart of graph for your needs. But it won’t stop there. Stranding your data in isolated, static graphs limits the number and depth of questions you can answer. Let your analysis become your organization’s centerpiece by using it to fuel exploration. Combine related charts. Add a map. Provide filters to dig deeper. The impact? Immediate business insight and answers to questions that actually drive business decisions. Bar charts are one of the most common data visualizations. 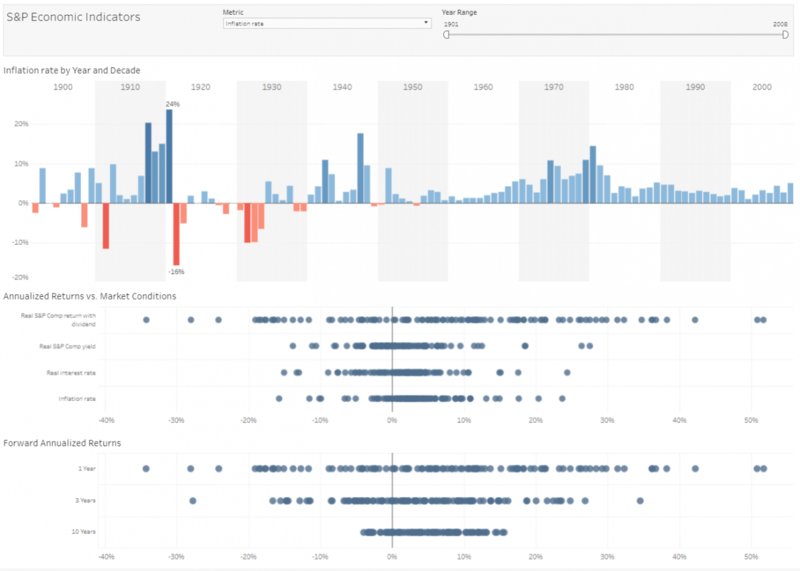 With them, you can quickly highlight differences between categories, clearly show trends and outliers, and reveal historical highs and lows at a glance. Bar charts are especially effective when you have data that can be split into multiple categories. Comparing data across categories. Bar charts are best suited for data that can be split into several groups. For example, volume of shirts in different sizes, website traffic by referrer, and percent of spending by department. Include multiple bar charts on a dashboard. Comparing several bar charts at the same time is much easier than trying to spot patterns across multiple slides. Add color to bars for more impact. Color adds a quick, visual identifier that makes deep comparisons easy. Use stacked bars or side-by-side bars. Stacked and side-by-side bar charts let you break down your data even further, giving more depth to your analysis. Combine bar charts with maps. Maps are a powerful and intuitive way to visualize data. Using a map as a filter lets viewers drill down and find detailed answers. Put bars on both sides of an axis. Plotting positive and negative data points along the same axis makes trends and outliers stand out. Try Pareto analysis by combining bar charts with table calculations. Use table calculations to create a Pareto chart, showing the accumulation of multiple categories. 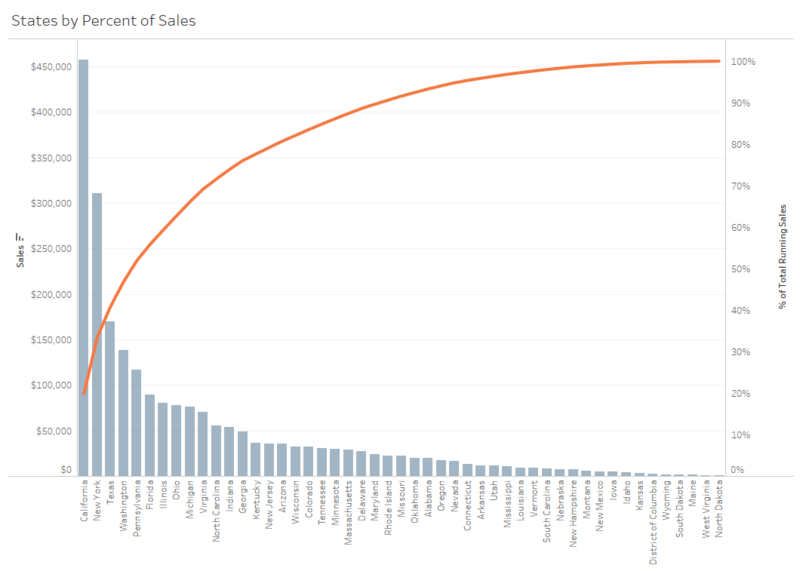 This Pareto chart shows that roughly 20% of all sales are coming from the state of California. In this example, the bar chart quickly shows when inflation rates rose and dropped. In the first half of the century, the drops were more dramatic than in more recent history. The line chart, or line graph, is another familiar method for displaying data. It connects several distinct data points, presenting them as one continuous evolution. The result is a simple, straightforward way to visualize changes in one value relative to another. View trends in data, usually over time. Line charts are most often used to show a value evolving over time, but they aren’t limited to that. Any dimension—like date types, time intervals, and other ordinal data—can be used as the horizontal axis. For example, stock price change over five years, website page views during a month, and revenue growth by quarter. Combine a line graph with bar charts. Bar and line charts go well together. Showing two kinds of information on the same axis adds powerful context to your data. Shade the area under lines. Shading the area under line charts provides an immediate visual cue of quantity, and can improve the look and feel of your graph. When your graph includes multiple lines, use multiple colors to inform the viewer of each line’s relative contribution to the whole. 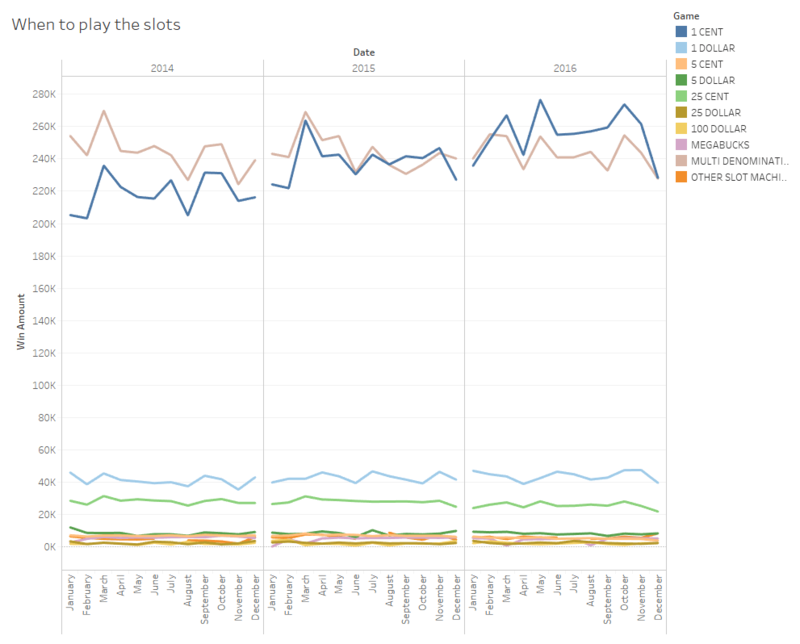 This line chart show which slot machines have the largest winning amount while also showing the seasonality. Pie charts are powerful for adding detail to other visualizations. Alone, a pie chart doesn’t give the viewer a way to quickly and accurately compare information. Since the viewer has to create context on their own, key points from your data are missed. Instead of making a pie chart the focus of your dashboard, try using them to drill down on other visualizations. This approach uses the pie chart’s simplicity to add information, without distracting from the larger picture. Alongside other charts. A pie chart is most impactful when used to add information to other types of charts and graphs. Drill down on other visualizations. This approach uses the pie chart’s simplicity to add information and context, without distracting from the larger picture. Limit pie wedges. If you have too many proportions to compare, the viewer may have trouble getting meaning from the chart. Similarly, limit dashboards to a small total number of pie charts. Overlay pies on maps. Pie charts can further break down geographical trends in your data, creating a compelling visualization. Adding the pie charts to the map allows the viewer to quickly see how particular states are profiting from different product categories. Maps are a no-brainer for visualizing any kind of location information, whether it’s postal codes, state abbreviations, country names, or your own custom geocoding. Maps highlight geographic trends in a format everyone knows and understands. Display geocoded data. If you have geographic information associated with your data, maps are a simple and compelling way to show how location correlates with trends in your data. For example, insurance claims by state, product export destinations by country, car accidents by zip code, and custom sales territories. 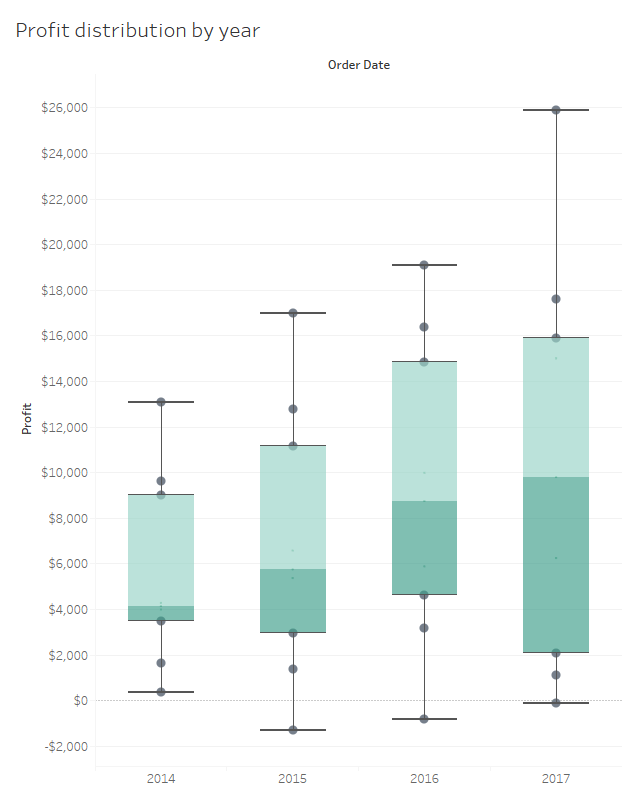 Use a map as a filter for other types of charts, graphs, and tables. A map provides an intuitive way to drill down in to your data. Viewers can see large trends at a glance, and use filter actions to quickly investigate even further. Layer data points on top of maps. Marks can be overlaid on a map to show individual data points with more precision. Try varying their size to add more visual detail to your analysis. Read Maps: The Power of Where to learn how using maps effectively helps drive better business decisions. 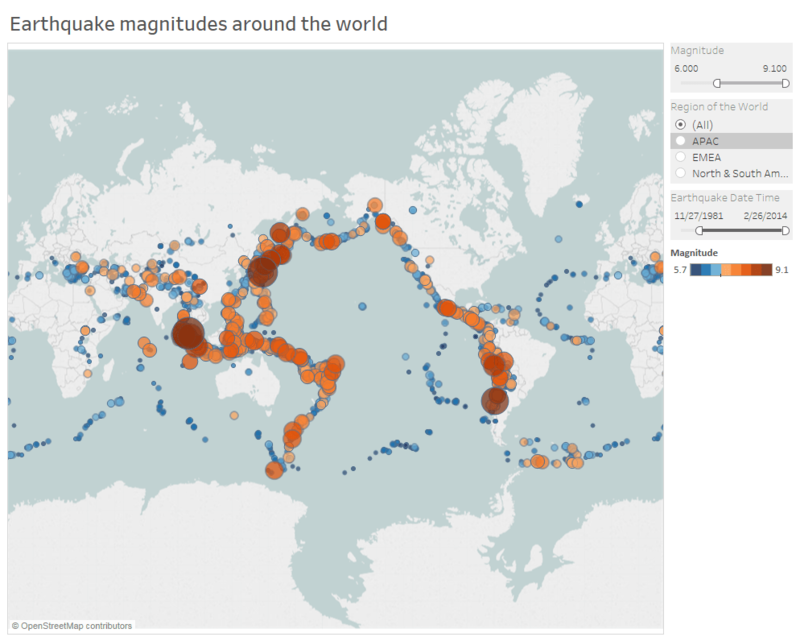 By layering the magnitude of an earthquake on top of the map, the viewer can see where bigger earthquake occur. Scatter plots are an effective way to give you a sense of trends, concentrations, and outliers that facilitate deeper investigations of your data. A scatter plot presents lots of distinct data points on a single chart. The chart can then be enhanced with analytics like cluster analysis or trend lines. Investigate the relationship between different variables. Scatter plots are used to show if one variable is a good predictor of another, or if they tend to change independently. This type of chart easily lends itself to many types of analysis. For example, male versus female likelihood of having lung cancer at different ages, technology early adopters’ and laggards’ purchase patterns of smart phones, and shipping costs of different product categories to different regions. Use cluster analysis to identify segments. Cluster analysis groups data points into distinct segments, based on the variables you select. Use highlight actions. By adding a highlight action to your scatter plots, quickly see which points have attributes in common, without losing sight of the rest of the dataset. Use custom mark types. Custom marks add a quick visual cue to your chart, clearly distinguishing different groups of points. 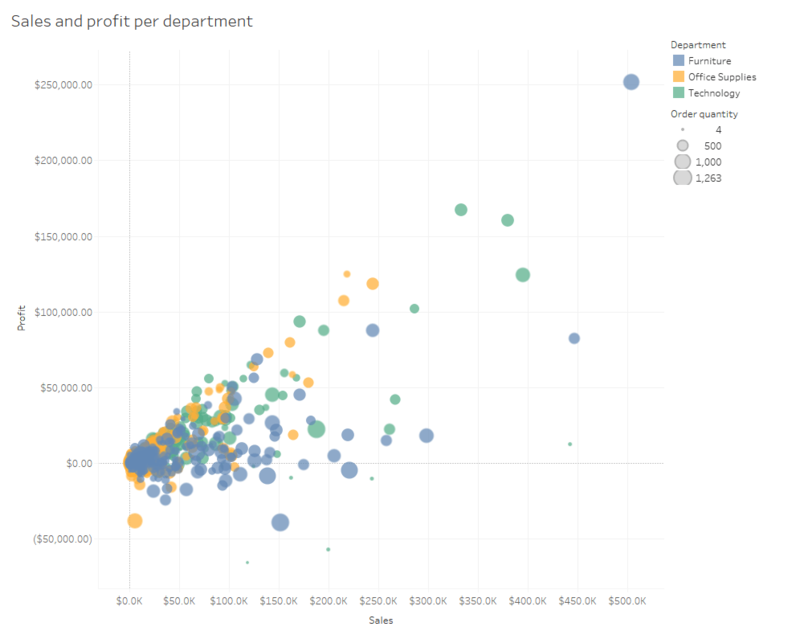 This scatter plot shows how sales and profit compare across department, and it quickly lets you see any outliers. Gantt charts are purpose-built for illustrating the start and finish dates of steps in a process or project. A Gantt chart shows steps that need to be completed before others can begin, or which resources are overcommitted. Gantt charts aren’t limited to projects, though: Represent any time series data with this chart type. Try using a Gantt chart to show how a multi-step process has performed over time. Color can be used to show which steps are under- or over performing. Display a project schedule. A Gantt chart can easily illustrate key deliverables, owners, and deadlines. Show changes in use or activity over time. Time series data is presented in a natural, easy to understand format on a Gantt chart. For example, duration of a machine’s use, or availability of players on a team. Add color. Changing the color of the bars within the Gantt chart quickly informs viewers about key aspects of the variable. Combine maps and other chart types with Gantt charts. 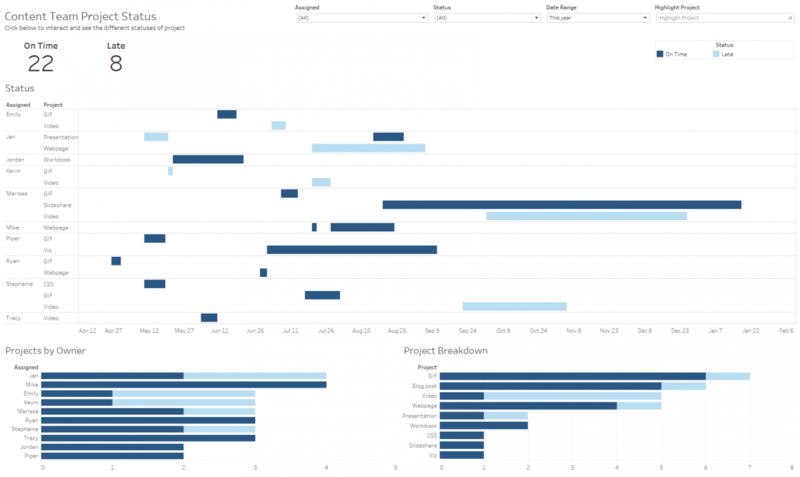 Including Gantt charts in a dashboard with other chart types can help correlate otherwise disconnected data. Using this Gantt chart, the team knows which pieces of content are on schedule and which are running late. Although bubbles aren’t technically their own type of visualization, using them as a technique adds great detail to scatter plots or maps. 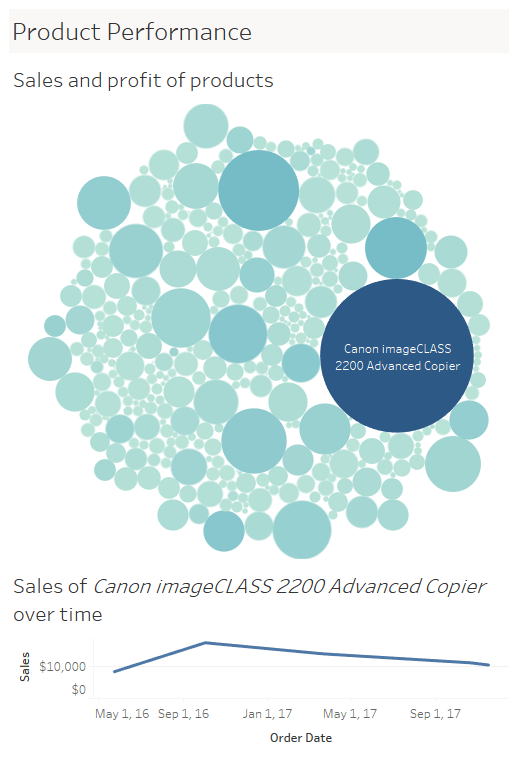 Varying the size and color of circles creates visually compelling charts that present large volumes of data at once. Show the relationship between three or more measures. Bubbles can add more detail to the traditional two axis chart, highlighting the relationship between three or more variables, without overwhelming the viewer. Overlay on maps. Bubbles quickly inform a viewer about relative concentration of data. Using these as an overlay puts geographically-related data in context quickly for the viewer. In this example, the bubble chart can be used as a filter for the line chart to better understand how sales for a particular product have performed over time. Histograms show how your data is distributed across distinct groups. By grouping your data into specific categories (also known as “bins”), then plotting the number of records in a category as a vertical bar, you can quickly see which bins the majority of your data falls in. Understand the distribution of your data. The histogram is your best option for visualizing how data falls into categories. For example, number of customers by company size, student performance on an exam, and frequency of a product defect. Test different groupings of data. Creating a variety of histograms can help to determine the most useful groupings of data. Add color to break bins down. Apply color to bars representing each group to show a second set of categories on the same chart. 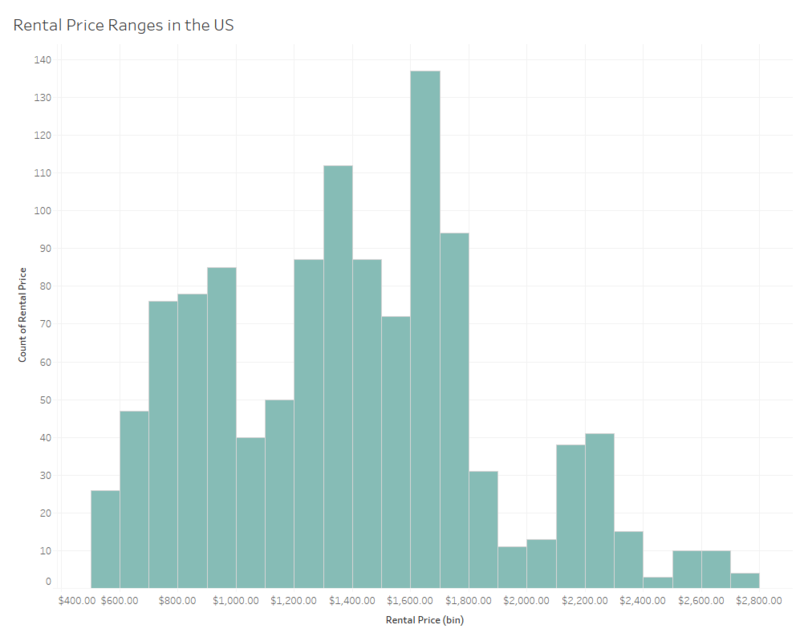 The histogram gives a breakdown of the distribution of rental prices throughout the United States. Bullet charts show progress against a goal by comparing measures. At its core, a bullet graph is a variation of a bar chart. Designed to replace dashboard gauges, meters, and thermometers, a bullet chart shows more information while using less space. Quickly compare a metric to a goal. A bullet chart shows how a metric is doing at a single point in time. Because it doesn’t display history, this chart is best suited for quick “how are we doing” dashboards, rather than deep analysis. Use color to illustrate achievement thresholds. Including color as a backdrop gives the viewer another reference to better understand how performance is measured against goals. Add bullets to dashboards for summary insights. Combining bullets with other chart types into a dashboard supports productive discussions about where attention is needed to accomplish objectives. 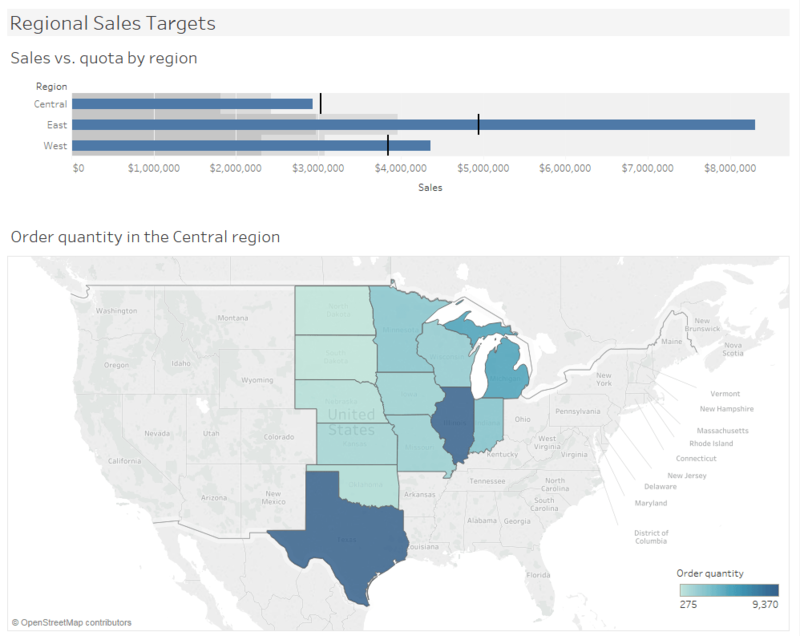 In this dashboard, the view can see that the Central region has not yet hit quota. By using the bullet graph as a filter for the map, the viewer can see where there is more opportunity to sell. 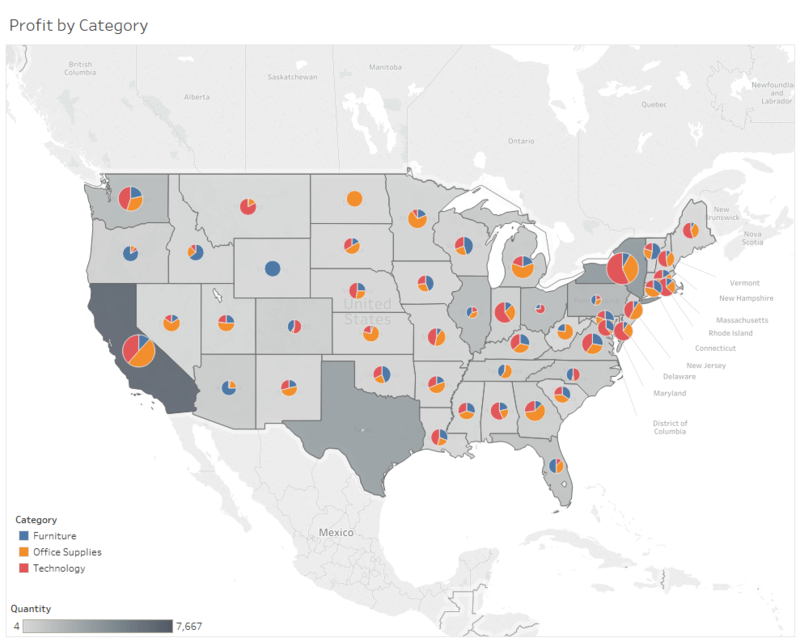 Heat maps are a great way to compare data across two or more categories using color. Patterns guide viewers around the chart, quickly showing them where the intersection of categories is strongest and weakest. Comparing categorical data using color. Heat maps are best for presenting data sets with lots of categories. This chart type can pack hundreds of comparisons into a small area, and still be easy to understand at a glance. For example, sales quota assessment, actual spending vs. budget, and performance spectrum (great/good/poor). Vary the size of squares. Changing the size of the squares adds significance to the heat map’s visual analysis. For example, shrinking a square creates whitespace around it, de-emphasizing it and directing the viewer’s eye elsewhere. To discover more tips for optimizing your dashboard layout, read The Do’s and Don’ts of Dashboards. 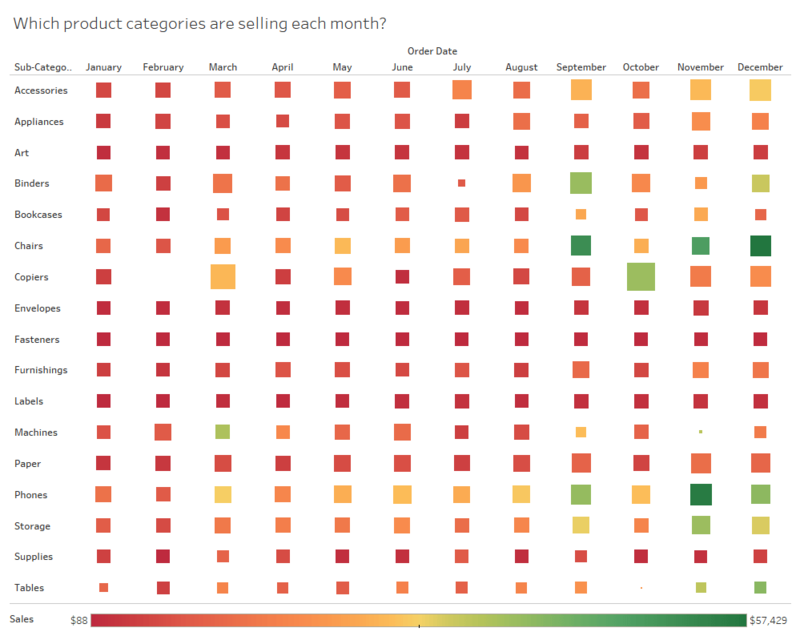 The heat map gives the viewer a quick summary of how different product categories are performing compared to each other per month. 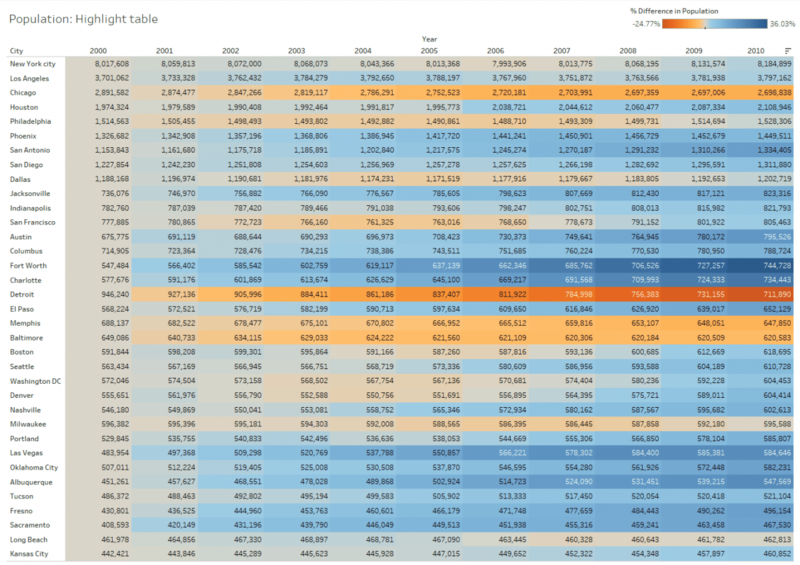 Highlight tables take heat maps one step further. In addition to showing how data intersects by using color, highlight tables display number by cell, providing additional detail. Draw attention to detailed information. A highlight table uses color to grab the viewer’s attention, while still presenting precise figures. For example, segmentation analysis of target market, product adoption across regions, and sales leads by individual rep. Combine highlight tables with other chart types. Buttressing a line chart with a highlight table, for example, lets a viewer keep overall data trends in mind while drilling down into specific cross sections of interest. The highlight table draws the eye to see the biggest percent changes in population per state. Treemaps relate different segments of your data to the whole. By nesting rectangles within others, treemaps show how individual data points fit in a hierarchy. As the name of the chart suggests, each rectangle is subdivided into smaller rectangles, or sub-branches, based on its proportion to the whole. They make efficient use of space to show percent total for each category. Show data with multiple levels of categorization. When a dataset can be broken down in many different ways, a treemap might be the best way to show what categories most of the data falls in. For example, storage usage across computer machines, managing the number and priority of technical support cases, and comparing fiscal budgets between years..
Color the rectangles by a category Because treemaps are such a dense chart type, color makes it easier for the viewer to distinguish one category from another. 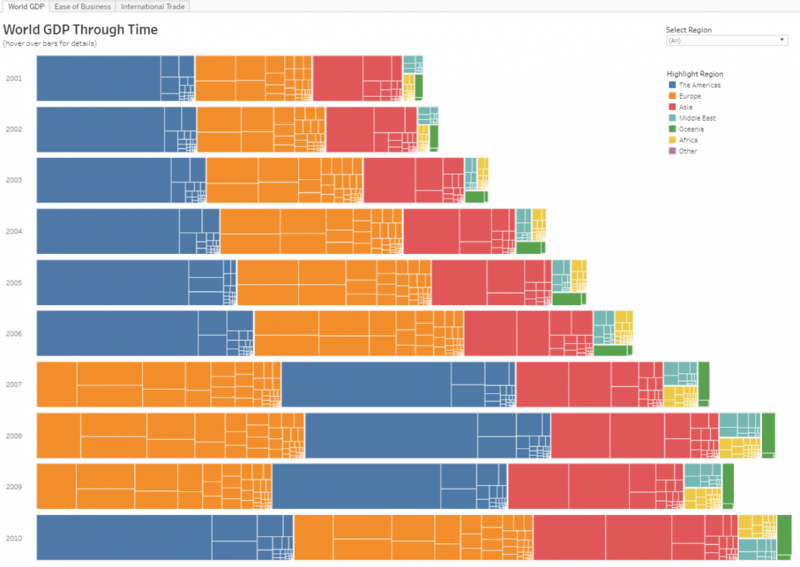 Combine treemaps with bar charts. Bar charts whose “fill” is a treemap are a visually impressive way to drill down into data. The bar chart lets the viewer quickly compare items through the bar’s length, while also showing the breakdown of categories within each bar. The use of the treemap within each bar lets the viewer see which regions had the highest GDP each year. Box-and-whisker plots, or boxplots, are a common way to show distributions of data. The name refers to the two parts of the diagram: the box, which contains the median of the data along with the 1st and 3rd quartiles (25% greater and less than the median), and the whiskers, which typically represents data within 1.5 times the interquartile range (the difference between the 1st and 3rd quartiles). The whiskers can also be used to also show the maximum and minimum points within the data. Show the distribution of a data set. Use box-and-whisker diagrams to understand your data at a glance. See how data is skewed towards one end and identify outliers in your data. For example, comparing scores between sites, analyzing data before and after a process change, or examining data from duplicate machines manufacturing the same products. Hide the points within the box. This helps a viewer focus on the outliers. Compare boxplots across categorical dimensions. Boxplots are great at allowing you to quickly compare distributions between data sets. In this example, the viewer can quickly see how the profit distribution has changed over time. Candlestick charts are commonly used for financial analysis, showing metrics about a financial instrument over a period of time. This chart type shows the open, close, high, and low values of an instrument over time, in an easy to understand format. Show financial data. A candlestick chart is an advanced chart type, meant specifically for financial analysis. Though it may look like a box-and-whisker plot, these two charts do not have the same meaning. Present multiple separate candlestick charts. Trying to layer too many data points on a single chart can be confusing and difficult to navigate. Creating clear distinctions helps the viewer to analyze the charts separately. Use highlight actions to correlate data. Time-series data can be difficult to keep track of. Highlight actions allow a user to focus on a single date, while still seeing the historical information in the rest of the chart. Candlestick charts enable you to perform price and volatility analysis in one view. 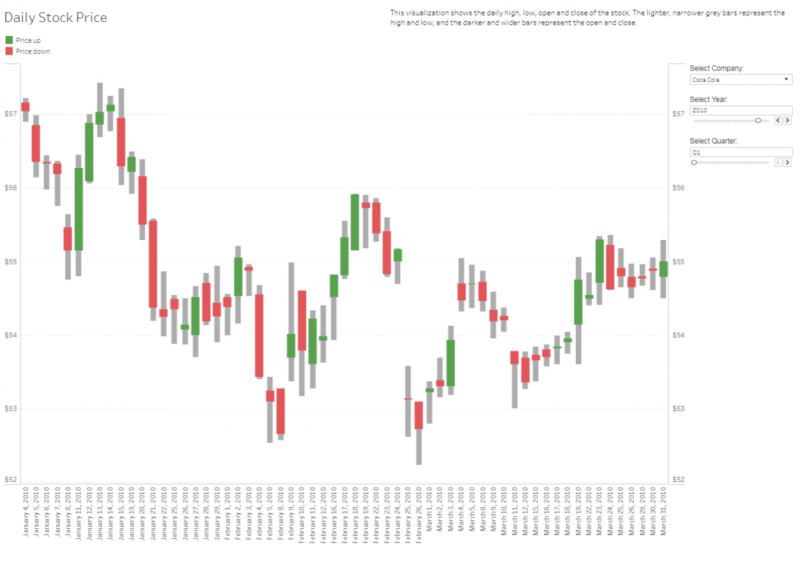 In this example, track Coke or Pepsi’s stock prices in one compact view.